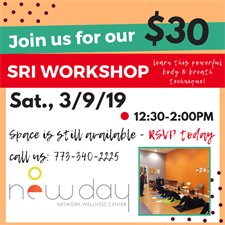 RSVP FOR THIS WORKSHOP BY CLICKING HERE! 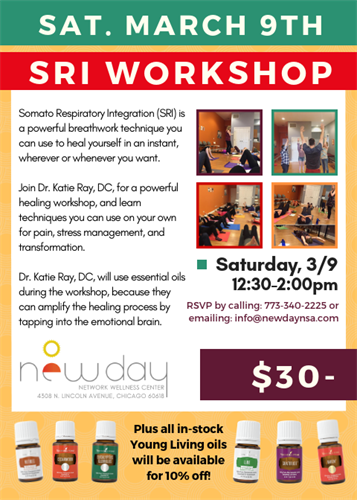 Somato Respiratory Integration (SRI) is a powerful breathwork technique you can use to heal yourself in an instant, wherever or whenever you want. Essential oils amplify the healing process by tapping into the emotional brain. Join Dr. Katie Ray, DC for a powerful healing workshop, and learn techniques you can use on your own for pain, stress management, and transformation. The workshop will feature a group healing experience, plus one-on-one attention. Questions or RSVP? Please email us at info@newdaynsa.com.